A Literary Odyssey: Book 42: Finished. I think that I picked a great Hardy novel to begin with. I am always a little wary of picking up an author off my list that I haven't read before (or even heard of-again, my English education seems to have been not as extensive as it should have been). So far, I seem to have been lucky with the unknown authors I have read (Forster, Arnow, Dostoevsky, Morrison, Zola, and Emily Bronte). Although, truth be told, I have only had one horrible experience in re-reading Charles Dickens' Great Expectations, and lukewarm experiences with Albert Camus' The Stranger and Chekov's The Cherry Orchard. Anyway back to Hardy. Many of his other titles I have heard mixed things about. It seems like Hardy might be one of those writers you either love, or you hate. I could be wrong, but based on what I have seen, that seems to be the case. And after finishing this lovely novel, I may be in the "love" camp. I love the ambition of what Hardy tried to accomplish in this exploration of one man's character. Taking Mayor Henchard from the drunken idiot who sold his wife in the first pages of the novel, to the end where he begins to regret the decisions he made...well, it was a wonderful journey of a man who could very well be the man next door. I loved the complications between Henchard and his daughter, as well as the people around him. He made a wonderful villain...and a person who really wanted to root for. I also really liked his daughter. She began as a mostly uneducated woman, but she really made big strides to learn and better herself. That is a quality I truly admire in people. I mean, to work hard to learn new things and grow at any age is commendable. It is a trait I hope that I have. 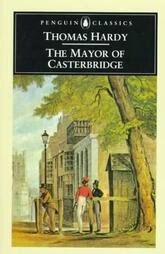 In any case, The Mayor of Casterbridge was a wonderful novel about the way choices can impact your life, and at any stage of your life. It was a novel I fell in love with, but I am curious to see the depth in Hardy's other work before I can judge him. "Her experience had been of a kind to teach her, rightly or wrongly, that the doubtful honor of a brief transit through a sorry world hardly called for effusiveness, even when the path was suddenly irradiated at some half-way point by daybeams rich as hers. But her strong sense that neither she nor any human being deserved less than was given, did not blind her to the fact that there were others receiving less who had deserved much more. And in being forced to class herself among the fortunate she did not cease to wonder at the persistence of the unforeseen, when the one to whom such unbroken tranquility had been accorded in the adult stage was she whose youth had seemed to teach that happiness was but the occasional episode in a general drama of pain," (292). This gives me an incentive to pick up another Hardy. So far I’ve read Far from the Madding Crowd, Jude the Obscure, Tess d’Uberville and A Pair of Blue Eye. Apart from the first, he’s never easy on his characters and redemption doesn’t seems to be part of his dictionary. Jude the Obscure in particular was one of the saddest books I’ve ever read. I like his style, but the sadness is too much sometimes. I’ll give Hardy another try with The Mayor of Casterbridge. On another note, I see you’re reading Gone With the Wind. It was one of my best from 2009. I’m looking forward to your views on it!